A good photo is more than just a perfectly timed snap of your pet’s classic grin. A truly good photo utilizes many unique elements which a successful photographer needs to know. A key technique for making captivating images is known as the rule of thirds. The rule of thirds is a compositional method that divides the photo into a 3×3 grid. A simple mathematical placement of horizontal and vertical lines allows you to draw the viewer’s eye through flow and balance. 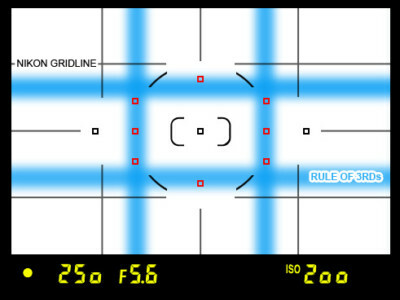 The blue lines represent the rules of thirds containing the 4 power points otherwise the locations of intersection which are the areas where the subject of your photo should be placed. Your subject should be positioned upon the area where the horizontal and vertical lines intersect in order to create a pleasing photo. Considering your choice of camera brand and age, the ability to employ a grid onto your viewfinder may be limited. However for those with Nikon cameras that contain an LCD, you can go through Menu >Customs Menu > Shooting/Display* >Rule of thirds or Grid. For the Cannon users, you must go through Menu> Camera Tab> scroll to Customs Display> Grid Lines. If there is no way your camera can be optimized for rule of thirds, don’t worry a simple solution is at hand. Any photo editor from Photoshop to Pixlr offers the option to place the 3×3 grid over your image and crop according to your preference. It’s important to understand however that the rule of thirds is not always beneficial. Sometimes a subject’s symmetry is meant to be appreciated or power is meant to be given and taken, it’s all subjective to the art you want to create. Nevertheless the rule of thirds presents a method of composition that offers balance and complexity yet does not take the life out of the subject. Looking at this image you can see how the imaginary lines draw eyes to the little behind of the dog, it adds dimension and life. 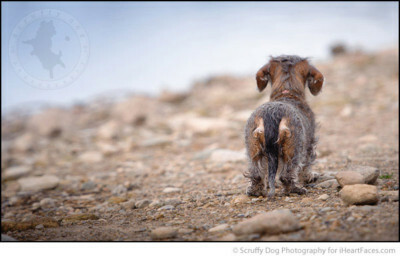 The blog Scruffy Dog Photography contains numerous portfolios that showcase beautiful photos that use rule of thirds.